Prologue: Fun With Rocks For Your Health! 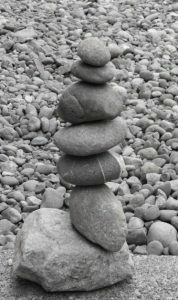 Cairn Art is a simple recreational way to relaxation that turns off stress and worry because to balance and stack the Cairn you can’t be thinking of anything else, even what worries you. Like a muscle massage, the fun of Cairn Art relaxes your brain so that you can think well: In addition, playing with Cairn art is an aid for healing emotional wellbeing that builds self-confidence and courage. You can make a Cairn with big rocks or small rocks, makes no difference. When your brain is over-stressed it can cause your physical health to be stressed: The result is that your body can’t heal itself properly and that invites life shortening events of poor health and poor emotional responses causing impacts that can threaten your physical health and wellness. In ancient and modern times, Cairns serve to prevent wilderness hikers from getting lost: In addition, you might say that concentration on constructing a Cairn may help you from “losing your mind in the wilderness of on-going change, occasional misfortune and the day by day life stresses of uncertainty”! Can help you heal your strife! Play with Cairn Art to relieve stressing shocks! That gives your brain some relieving slack! Cairn Art postpones the grasp of the “Grim reaper”! That’s the secret to giving your mind some relieving slack! Stacking those rocks doesn’t require fame! Big rocks or small rocks…works the same! They will help you turn off stress from your head to your socks! A sure way to healing recreation! You may even delay the “Grim Reaper”! This author has found that Cairn Art is a joyful way to relax from the excess stresses of modern day ongoing change, occasional misfortune and its life’s stressing uncertainties! The following resources are recommended for exploration to help you discover ways for controlling and reducing over-stressing that threatens your wellbeing and wellness. As you explore the following resources I believe that you’ll discover other ways to help you feel happy and well! That’s a great goal for life and living, eh? *Here is another useful resource for shutting off self imposed stresses from ongoing change, occasional misfortunes and the fickleness of uncertainty. You can if you THINK and write a plan, you can! If It Is To Be, It Is Up To Me ! ©2019 by Blooming Bobville the positive response practical poet. www.fivestarteacher.com and may you always be fresh and blooming day by day! P.S. Go to the bottom of this post and click on archives for exploring other self-help uplifting poetry by Blooming Bobville the positive response practical poet. P.P.S. https://www.youtube.com/watch?v=hlWiI4xVXKY My favorite soothing instrumental music accompanied by mystical forest scenery by Peter Helland of Norway.